We had just gotten back from a weekend in Wisconsin celebrating Shannon's grandpa's 83rd birthday. Charlee was quite a whiner... just like she had been all week long. Well, the last several weeks, actually. She requires a lot of attention, and she is very bossy in the way she requires it. You have to play with the toy she wants you to play with (usually Goofy but sometimes Mickey or Pete), and you have to act the same way you acted the first time you did this game months ago, and god forbid you try to talk to anyone else (such as your wife) while you do it. It was 5pm, and the Super Bowl was about to kick off in a half hour, and thanks to the day spent in the car, I still needed around 7,000 steps for the day to continue my 153 day streak of getting 10,000 steps. I thought I should get a quick walk in while it was still bright out (and so I could enjoy the 70 degree swing in temperature from earlier in the week, when it went from -30 to 40 degrees). Charlee, who I was playing with while I had that thought, wanted nothing to do with that idea. She insisted I stay and pretend I was Pete and that I needed to help Little Minnie get tucked in for bed. Since my throat was a little sore, I grew weary of the Pete voice and said, "Charlee, you can either stay here with mom and play, or you can go on a walk with me." Charlee sobbed and said she wanted to stay home, so I put my jacket on, loaded up a podcast, and started out the door. I didn't even get 3 houses down the street when I get a call from my wife. Charlee changed her mind and wanted to go on a walk with me. Annoyed, I turned around and came back home. By the time I got in, mom already helped Charlee into her boots. I helped her into her coat and hat and we set out the door. Before we got out of the garage, I noticed she had two stuffed animals with her. One, her beloved Bumba. Two, a stuffed lion holding a heart that says "Love" that her mother won from an arcade game earlier that day. I figured she might drop one of them, and due to the sloshy roads, I didn't want her to risk dropping Bumba, which would've required giving him a "bath." I told my daughter she could only bring one stuffed animal on the walk. She sobbed when I took her best friend out of her hands, but after a few steps down the road, she was just fine. We started out painfully slowly. Again, I was slightly irritated that my brisk walk devolved into a turtle's pace, but these are the cards you are dealt sometimes as a parent. We made our way out of our subdivision and towards the fire station. Now, a few months ago, I took Charlee to an open house at the other fire station in town. She, as with most new experiences, wanted nothing to do with it. I showed her every possible thing you can see in that station, but she just wanted to go home. In a last ditch effort, I forced her to go up into an empty fire truck. After she wiped the tears from her eyes, she looked around and was mesmerized. She immediately started pretending she was driving to a fire to help someone out. About 10 minutes later, the tears reemerged, but this time, they were caused by not wanting to leave this new experience. As we strolled by the fire station on our walk, she asked me (as she has every day since the open house) if we could go inside. I told her not until they have an open house. She then said, "Daddy, I want to be a fighter fighter." "Do you mean 'fire fighter?' I asked. "No, a fighter fighter,” she insisted. Right then and there, my whole mood shifted. I looked down at her with the biggest smile I've ever smiled in my life. The rest of the walk, we had an amazing conversation. We talked about her new stuffed animal (who developed quite a personality). We talked about senses and which body parts help gather those senses. We held hands for the entire walk. We both laughed incredibly hard. She kept insisting that when she grows up, she's going to be a fighter (fire) fighter. As we rounded the corner to complete the loop around our neighborhood, Charlee said "I want to do another one!" I looked down at my watch. It was now 5:30, and the game was starting. But instead of fighting with a screaming toddler, I thought I should give in and let her keep walking. Besides, we both were stuck in a car for 6 hours, we might as well both burn off some energy. The conversation continued to be lively and stimulating. Seriously. She might only be 2.5, but she has a lot of interesting thoughts rolling around that head of hers. Our pace began to quicken, even though we were both scared of slipping. We had held hands almost the entire 1.8 miles. About three quarters of the way through the second loop, my watch buzzed. It was a notification from my buddies making fun of something that happened at the game. I again thought about myself, missing out on this game. I was quickly brought back to reality when my little girl pulled on my hand and asked to do a third lap. At that moment, my mind fast forwarded to the future. A future where my daughter was 16 and wanted nothing to do with me or the Super Bowl. A future where she was 28 and she stopped by in the morning to say hello, but ultimately went to go watch the game with her friends. A future where I was 83 and too weak to walk for a mile. I stopped, pulled out my phone, and took a picture of my little girl. I asked her to look up at me and smile. As you can see, this is a blurry, ill-composed photograph. 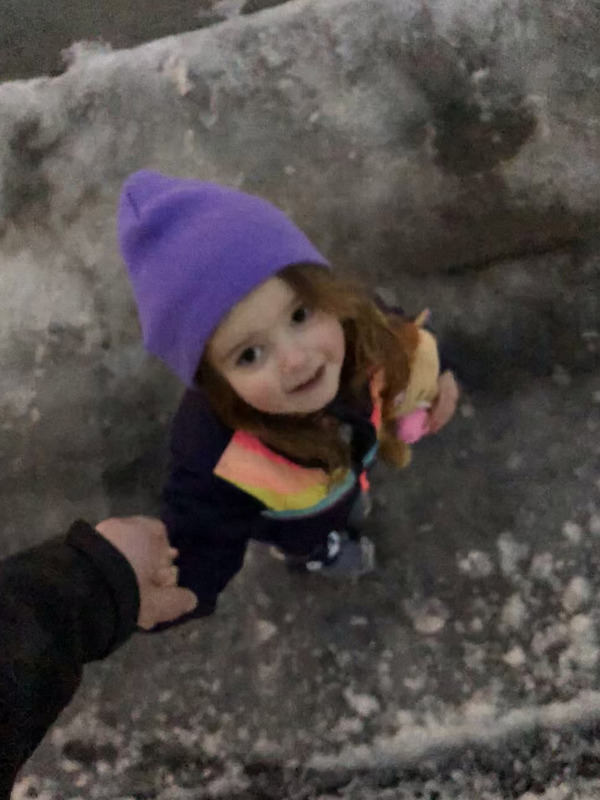 But in that future I imagined, I'm gonna look back at this picture and remember that for one brief, fleeting moment in my life, my little girl just wanted to spend another half hour walking through the sloppy, dark twilight with her daddy and her $1 vending machine lion. Instead of another lap, we ultimately decided to go inside and take a bath. But you can bet that in the morning, I know I'll have a walking buddy all set to hit the pavement with me.